Finally, KOEI have released a Dynasty Warriors game with depth on the PSP which once again returns gamers to the wondrous mythology of the Three Kingdoms. Apart from the battling it out in single-player, this current instalment of the game also supports a great four-player mode via adhoc wireless, however more on that later. The first thing you will notice about this game is the impressive visualisation that is quite slick and boasts some amazing pre-rendered cutscenes that assists with the “story”. Before embarking on your gaming adventure, players must select one of three kingdoms and their powerful heroes to control. Although the kingdoms don’t really have their pros and cons, where this comes into play is through the characters you have chosen to control. 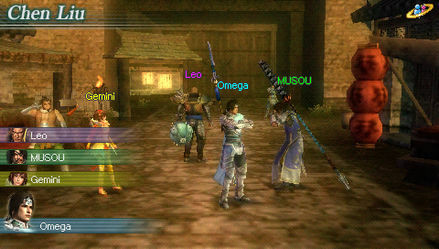 Whether it’s the lithe like and beautiful Xiao Qiao with her razor sharp war fans or Xiahou Dun and his powerful giant mace, it’s a pleasure to play all the characters in the game due to the variety. 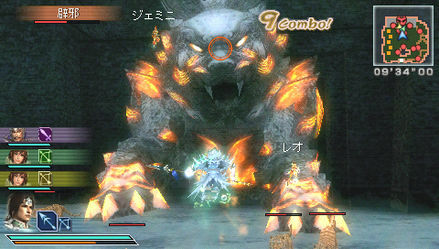 The characters also have some specialty maneuvers and a primary and secondary weapon which makes for some interesting gameplay. Although its your traditional hack and slash game, gamers have access to a fury bar that will continue to build as you fight and take damage, once this has reached capacity, you can then unleash your fury on your enemies and gives you super powers such as speed and flight to engage your foes. Although the crux of your gameplay is your traditional Dynasty Warriors experience, the interaction with your kingdom is a little different. Players begin in a village that allows you to access notice boards (quests), blacksmiths, workshops, markets and the like which gives the title a unique and almost Western RPG experience. By completing questions, you are awarded experience which can then be used to level your character and of course become more powerful. Although the single-player mode is quite riveting, multiplayer is truly a treat and we tested this feature with three people that worked quite well and was almost like a Gauntlet experience as you take on the never ending hoard of enemies. During the missions, you will find various treasures and weapons to assist your character which only adds to the overall experience. With that said, the game contains hundreds and hundreds of weapons available to the player and exploring their pros and cons is quite fun. Knocking your enemies in the air with your massively impossible swords is what these games are all about. Yes, the gameplay does become repetitive but this is what Dynasty Warriors is about, taking on an unending horde of enemies. Deliciously entertaining! 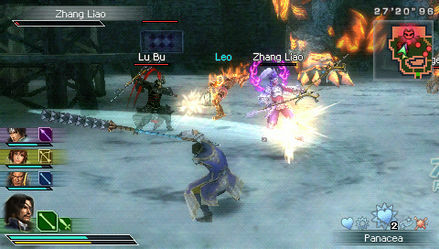 Graphically, the game is visually impressive on the PSP with detailed in-game graphics from character designs to backgrounds. The cutscenes are amazing and really assist in drawing you into this wondrous mythology. The soundtrack compliments the game nicely and although nothing memorable, it does assist with the overall experience. 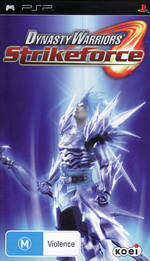 At the end of the day, Dynasty Warriors Strikeforce is an entertaining title that lovers of the Dynasty Warriors genre will thoroughly enjoy. Even if you have never ventured into this world, new comers will enjoy the low learning curve and entertaining gameplay as you attempt to take on the various enemies of the three kingdoms. Classic gaming on the PSP!